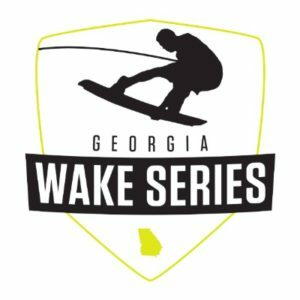 Atlanta, Georgia (March 1, 2018) – Action Event Group, LLC is pleased to announce the 2018 Georgia Wake Series. Following a sophomore year that saw the Series expand the schedule with an additional cable stop, resulting in nail-biting finishes where State Champions were not determined until the final pass, the season was a tremendous success. 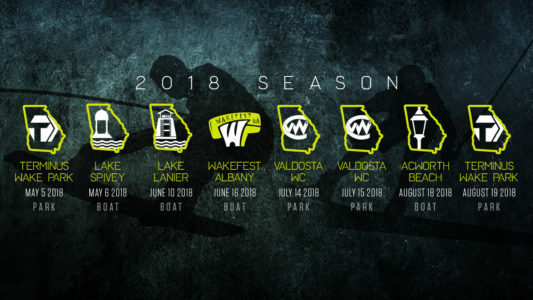 For 2018, the Georgia Wake Series grows to eight total events including four cable and four boat stops, making it the most balanced grassroots series in the country. In only two years, over 200 riders from a dozen states have participated. With a ton of momentum, sponsorship support, and robust purse and prizes, this is a figure surely to increase for 2018. The 2018 Georgia Wake Series features Terminus Wake Park as the opening and closing events, visits The Olympic Rowing Venue at Lake Lanier, Wakefest, and Lake Acworth, while expanding to a two-day weekend event at Valdosta Wake Compound and adding an all new stop at Lake Spivey, a private lake near the metro Atlanta area. The Georgia Wake Series is proud to have the continued support of several key brands, including e-commerce giants and longtime grassroots supporters Ambush Board Company and Buywake.com, a partnership that has been ongoing since the Series’ inception. For 2018 Action Event Group is proud to announce an exclusive tow-boat relationship with WaterSports Central, a dealer rooted in Georgia watersports for 19 years and counting. All 2018 boat events will be pulled entirely by MasterCraft boats, featuring the perfectly clean and consistent wakes MasterCraft is known for. Save the dates now and keep your eyes peeled for announcements on all of our 2018 sponsors, registration, new rules, and more! Follow the Georgia Wake Series on Facebook and Instagram. For more information including how to participate and support, visit www.gawakeseries.com.